51406-RB is rated 4.5 out of 5 by 2. Rated 4 out of 5 by mdcolores from Good product with issues Good overall product. First thing we did was remove the flow restriction fitting. Much better. The colored temperature indicator is nice for those of us who cannot read without glasses-pick your heat by hue! But- the slide mechanism/shower head holder failed after 6 months. It cannot be tightened and the shower head now falls out when you turn off the water. The Customer Service Dept was very helpful. Sending me out a new slide mechanism. Will update on progress. Is this slide bar also a grab bar? If not, do you make one? does this hand held come with the shower bar? can the shower head go on either side of the bar ? Can you change the angle of the shower head? So it points more toward the floor or more 90 degrees to the floor? 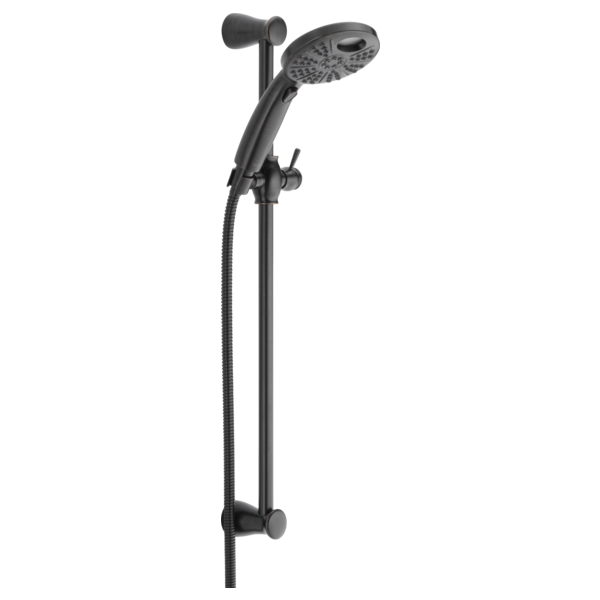 For an elderly person sitting, can the handheld shower have water going to it, but shut off to allow people to lather up? &ldquo;Connect the hose to your designated water supply&rdquo;. &nbsp;Does the COVER for the connection to the water supply come with the hand shower kit or do we need to order a cover. &nbsp;If so, where do I find this information on your web site?